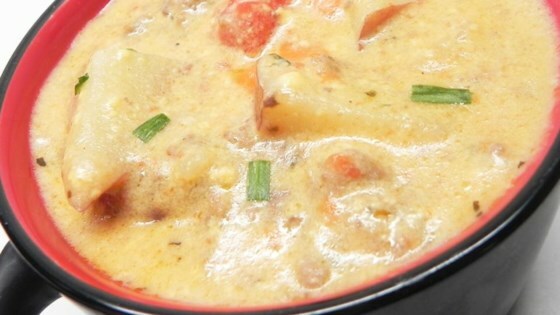 "This cheesy soup is one of my most requested favorites by friends and family. Nothing warms you up better than this great chowder. It is amazingly good." Combine beef, sausage, and onion in a large skillet over medium heat; cook and stir until browned, about 5 minutes. Drain off grease and transfer to a large pot. Stir broth, potatoes, carrots, garlic, parsley, basil, salt, and black pepper into the beef mixture. Simmer over low heat, covered, until potatoes are tender, about 15 minutes. Mix milk and flour together in a small bowl. Pour into the pot. Bring back up to a simmer until chowder flavors combine, about 5 minutes. Remove from heat. Stir processed cheese and sour cream into chowder when it is no longer boiling, to prevent curdling. Ladle into serving bowls and top each serving with some diced tomatoes. Quick spicy, creamy and comforting meal! Soup is very good!! Used all sausage, since I had some to use up. Makes a very filling meal. Soooo good! Freezes well too. I skipped the sour cream because I didn’t have any, and I didn’t notice it for tomatoes so I botched that. It was similar to a broccoli and cheese soup. Great recipe, switched potatoes to radishes, didn’t use flour. I have made this soup twice following the recipe exactly and it is one of my family's favorite. Great flavor and very hearty.